Whether from smoking your meat with hooligan antics or just logging a ton of miles, eventually you are going to need new tires. Let this guide answer some of the basic how, why, what and when of tire replacement. Buying new motorcycle tires ain’t what it used to be. In fact, it can be downright intimidating if you’re not up to date with the current vernacular that surrounds motorcycle tires: V or Z ratings, 180s, 240s, radial or bias ply, load indexes, speed ratings – see what I mean? It’s easy to get overwhelmed by the wealth of information that’s out there. 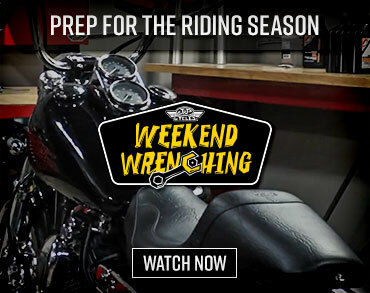 So Motorcycle USA wants to ease the pain of the process by offering a basic guide for knowing when it’s time to break open the wallet and come up with a few dollars to throw down for some new treads. Motorcycle tires are often ignored and underappreciated, which isn’t the smartest of decisions since they are the intermediary between you and a face-full of asphalt. 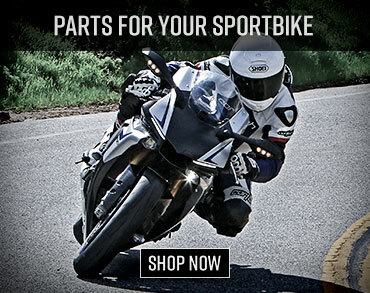 Even more than with automobiles, running on the proper motorcycle tires are paramount to safe transportation. The right tire can also mean the difference between being crowned MotoGP World Champion or settling for runner-up – just ask Valentino Rossi. Even if you’re not looking to drag a knee at Sepang, it’s just as imperative for the layman rider to keep their tires in the best possible working condition. Bridgestone, Michelin, Metzler, Dunlop and more… There’s a lot of tire ground to cover. So here it is. We’re by no means claiming to be the authority on tire selection and maintenance, but we wanted to provide readers with some general guides and answers to some of the FAQs when it comes time to slap on a set of new rubbers. Unlike factory racers who get a fresh set of rubber after each outing, us normal Joes will need to use some observation and common sense to determine when is the right time to swap tires. It doesn’t take a genius to know you need new motorcycle tires. When your back end starts to feel a little loose in corners that you’ve blasted through a hundred times before, it’s time to check your tread depth. Use the built-in tread wear indicators. When the tire is worn down to the indicators that are set at 1/32nd inch (0.8 millimeters) or when the tread groove depth is even less, it’s time to change. Thin tires are penetrated by nails and shrapnel much easier than ones with healthy tread. A good way to gauge this is with a penny. Take a penny and stick it upside down in the tread groove. The space between the edge of the penny and the top of Lincoln’s head is about 1/32nd of an inch. If Lincoln needs a haircut, you need a new tire. If the tire cord or fabric is exposed, the tire is dangerously worn and must be replaced immediately. It’s also a good idea to inspect the conditions of your wheels periodically. Bent rims may cause wheel wobble, bead unseating and, in the case of tubeless tires, gradual air loss. Sudden wheel failure may result from the use of cracked cast wheels. Bent rims and bent or cracked cast wheels should be replaced immediately. Finally, inspect your tires for uneven wear. Wear on one side of the tread or flat spots in the tread may indicate a problem with the tire or motorcycle. Always heed warning signs such as vibration, handling instability, rubbing or tire noise that occurs during operation of the motorcycle. If this is the case, it’s best to contact your local dealer. Going too long without new knobbies will ultimately result in something like this. Determining lifespan for off-road tires is more subjective, but using the wear indicators will help prevent this from becoming a common occurance. Off-Road – One of the main differences between street and dirt bike tires is in determining wear factor – you definitely don’t want to get your knobbies down to 1/32-inch! The most critical deciding factor is personal feel. Technically you can run those knobbies down to pathetic little nubbins, but the further they are worn, the more susceptible they are to puncture and fatigue failure, not to mention a lack of traction and safety. Once you can feel the performance of your tire slipping – literally – then it’s time to start looking for a replacement. Keep in mind that some rounding of the front edge can actually increase performance on harder terrain, so don’t go tossing a perfectly good tire if it isn’t biting right away. Most meats, however, are going to only get worse with age and use. Some tires chunk or tear worse than others, but watch the wear grooves in the center lugs to indicate how abused the rubber is. If there aren’t any grooves left it’s time to move on. CHECKING TIRE PRESSURES IS THE MOST IMPORTANT TIRE MAINTENANCE FUNCTION YOU CAN PERFORM. Why the capital letters? Because we can’t stress this enough. Check your tires’ air pressure at least once a week and before long trips. Be sure to use an accurate pressure gauge. Common sense, you say? You’d be surprised. Incorrect inflation can lead to uneven wear, so use your contact patches as an idicator. And remember, having too much pressure can be just as dangerous as too little. Check air pressure when the tires are cold. Tires are cold when a motorcycle has been ridden less than a mile at moderate speed or after it has been sitting for three or more hours. Never release air from a hot tire in order to reach the recommended cold tire pressure. Normal riding causes tires to run hotter and inflation pressure to increase. If you release air when your tires are hot, you may under-inflate your tires to dangerous levels. If for some reason your tires are losing more than two psi per month, the tire, valve, or wheel may be damaged. Have your local dealer check it out. Always keep the air pressure in both tires at the manufacturer’s recommended psi. Your motorcycle owner’s manual will tell you this magic number. On some motorcycles, the recommended front and rear tire pressures differ, and the numbers stamped on the sidewall of the tire are often only for maximum loads. Occasionally, these pressure numbers are the manufacturer’s recommended settings as well, but always check your owner’s manual first. Having the proper tire pressure improves handling, gas mileage and keeps you safer in the saddle. Riding on underinflated motorcycle tires is dangerous for several reasons. The tires will build excessive heat and can cause sudden tire failure. Under inflation causes irregular tread wear at the edge of the contact patch and may also damage the tire beyond use. It will affect cornering, cause you to lose precious gas mileage, and can cause fatigue cracking. Riding on tires with too much air is equally as dangerous. The tires are more likely to be cut, punctured, or broken by sudden impact. Overinflating will cause the bike to ride hard and will cause the tire to wear out quickly in the center of the contact patch. Do not exceed the pressure indicated on the tire sidewall. Consult your owner’s manual for the recommended psi and for other useful tidbits of info on your tires. Never inflate a tire unless it is secured to the motorcycle or a tire-mounting machine. Inflating an unsecured tire is dangerous because if it bursts, it could be hurled into the air with lethal force. All you custom guys and gals need to think twice about those chrome valve caps. Little things like that can eventually lead to a loss of air pressure. Be sure to monitor psi like your life depends on it – because it does. Another helpful hint is to use factory valve caps and to keep valve cores clean and clear of debris to help guard against air leakage. And while the chrome skull-shaped valve caps look cool, it’s better to keep the original caps on your valve stems because the manufacturer’s valves have a rubber gasket in the top and will seal better. Valve caps not only keep debris and water out of your valve stem, they keep the air in. Wheel rotation can be enough to cause a valve core to open due to the centrifugal force generated. Motorcycle tires with non-repairable damage must not be used again. This type of damage can be incurred by hard impacts, penetrations or by continued use of an underinflated/overloaded tire. Such types of damage are progressive and can cause sudden and complete tire failure and result in an accident. Off-Road – Most of this holds true for off-road as well, but because of the dirt world’s changing terrain, tires can serve as more of a ride-tailoring factor. Different rubber compounds and tread patterns are critical to finding the ultimate traction whether you ride in sand, mud, loam, blue-groove or any combination. Most bikes come from the dealership with an intermediate tread of some kind, which should work well enough to get you started. Once that tire is shredded, keep in mind how it performed and what your normal riding terrain is like before purchasing your next meat. Bike and tire manufacturers provide recommended psi figures, but in the dirt world they aren’t necessarily the end all be all. Changing terrain will play a huge factor in dictating air pressure for off-road tires. What works in one area may be completely wrong for your next ride, so adjust accordingly. Proper inflation depends entirely on where you are riding. High speed, rocky terrain requires higher psi to avoid pinching tubes and tacoed rims. However, leaving 18 pounds in after a weekend desert ride and then hitting the muddy forest trails for a mid-week outing will probably result in a soil sample. As a general rule of thumb, 11-15 pounds will get you through most terrain in suitable fashion, but don’t be afraid to experiment with the pressure a bit as you get more comfortable with your tires. Just make sure to make slow and steady adjustments. Elevation can also have an affect on inflation so it never hurts to pack a pump before you head out to the mountains. Always be sure to check your pressure and adjust it accordingly. Another thing to keep in mind with off-road tires is the rim lock, also called a bead lock. Since flats are more common off-road, these little babies can mean the difference between getting back to the truck or a long, miserable night. We like to run our rim locks pretty stinkin’ tight. Small punctures can sometimes be fixed on the trail with patch kits or slime (though this should only be used as a temporary fix to get you home), but if the tire spins too violently on the rim it will tear the stem out of the tube, and then there’s no hope for a simple repair. Make sure not to cinch the nut down so tight that it damages the rim, but we like to give ours an extra little twist just to make sure it’s going to hold. Wheel alignment and balance is key to a smooth, safe ride. Wheels that are out of spec also cause excessive tire wear. You might think it’s not as important to have motorcycle tires balanced and aligned, but it is. Have your tire/wheel assemblies balanced before using them and rebalanced each time the tire is removed or replaced. Unbalanced tire/wheel assemblies can vibrate at certain speeds, greatly accelerating tire wear. If you take off your rear wheel or adjust the chain or belt, have your tire balanced. Each revolution of an incorrectly aligned wheel can scuff off tread rubber, reduce tire mileage, and impair steering and cornering. Correct matching of front and rear tires is important for peak performance and handling. Mating a new tire with a worn tire is never a good idea. It is best to follow the Tire Selection guidelines provided by the manufacturers and change out both tires at the same time if possible. A new front tire with a worn rear tire can cause instability. Also, make sure that the tires are mounted in accordance with the directional arrows. There are two main reasons for directional arrows. The first of these is that some motorcycle tires now have tread patterns that are designed for a specific rotation for optimum performance, particularly on wet roads. Directional arrows indicate the proper directional rotation. Secondly, running a tire will set up a wear pattern and it might not roll smoothly if reversed. Use the directional arrow to re-fit a tire in its original direction. Off-Road – It isn’t as important in dirt to have matching tire sets. Plenty of riders even swap brands between front and rear based on their personal preferences. When it comes to wear, if you can afford a complete set at every change then go for it, but a front tire will generally last as long as two rears. Again, look at the wear markers and always err on the side of safety. Most off-road tires are not directional and can even be reversed to stretch additional life out of them. But, there are some, especially soft-terrain and dual-sport meats, that can have a specific rotational tread pattern. Always make sure to pay attention to any arrows or markers on the sidewall and obey them. Tires have a lot of technology in their construction these days. Different compounds and tread patterns create the ultimate blend of performance and longevity. But, mixing radial and bias is a no-no in most circumstances. Bias and radial tires have significantly different dynamic properties. Bias, bias belted and radial tires have different construction types and therefore have different abilities to carry side and peripheral forces as well as having varied damping characteristics. The introduction of radial tires required changes to certain characteristics of the motorcycle. The development of the radial tire led to frame modifications, new steering geometries and suspensions. That’s why it is recommended that a motorcycle be used with the type of tire construction that it came with originally. Do not mix bias ply and radial tires on the same motorcycle unless it has the approval of the motorcycle or tire manufacturer. Tread pattern is the outer part of the tire and in contact with the road. The profile of a tire and the rubber compound chosen is based on the use of the tire. Generally, street motorcycle tires with a harder rubber compound get better gas mileage but don’t stick to the road as well. The softer the rubber compound, the grippier a tire is, at the sacrifice of gas mileage. Tread has everything to do with the circumstances you’ll be driving in most. A treadless racing slick will stick to the road like glue but is useless in the rain. Tread is needed for traction in wet conditions. That’s why off-road tires have a very high tread. It enables them to maintain traction in the mud and deal with the adverse geography of off-road riding. Tread builds up heat within a tire and reduces its effectiveness. An all-round tire has a light tread with a medium-hard compound base. This arrangement allows it to travel many miles without breaking down fast and provides stability in varying conditions. Off-Road – Depending on where you ride, there is ultimately a tire compound best suited to your needs. Ranging from soft compounds for hard terrain to hard compounds for digging up that spongy loam, the type of rubber you use will directly affect your off-road performance. There is a difference in tread pattern and lug depth as well. Obviously, each tire is a bit different from any other, but aside from the normal variations, there’s a big change in recent years due to the development of modern 4-strokes. Different power delivery and handling characteristics have led tire manufacturers to build specific 4-stroke treads. These meats typically have a wider tread pattern and an increased amount of lugs, especially on the sides. It’s not to say that these tires won’t work for 2-strokes, or vice-versa, but the specialized designs are becoming more available as the tire industry catches up to the new technology. Tires that require tubes should have their bladders monitored as well. Even if the tube is functioning properly, t’s always a good idea to replace the tube whenever the tire is swapped, just for good measure. When putting on a new tire that requires a tube, slap on a new tube at the same time. Old tubes become stretched, and if an old tube is fitted in a new tire, it can crease and eventually fail due to thinning of the tube rubber. Tubes should be repaired only by an expert. Always match the size markings on tubes to the tire. Don’t fit tubes in radial motorcycle tires and don’t fit radials on rims requiring tubes unless the tubes bear matching size and radial (R) markings. Tires come with different load-carrying capacities. Read your owner’s manual. It will list accessory restrictions and a motorcycle’s load capacity. The maximum load figures are also molded on the tire sidewall. Before a trip, determine the total weight of luggage, equipment, and rider(s) to be added to the motorcycle. Be careful not to under-inflate tires which will reduce the bike’s load-carrying capability. Trailers can also cause extreme tire stresses and overloads that can cause irreversible damage and result in sudden tire failure and accidents. Most tire manufacturers do not recommend the use of trailers and will not warrant tires used on bikes fitted with trailers. Always be mindful of how much weight is on your machine. Tires are rated for certain load capacities and exceeding those recommendations is never a wise move. This Load Index Table will tell you how many pounds a tire can handle depending on its index rating. This load rating is often stamped on the side of the tire or you can consult your trusty owner’s manual. Give yourself a little time to get used to the way your new tires perform. When worn tires are replaced with differently patterned or constructed tires, they are not going to ride the same. When new tires are fitted, give them a break-in distance of at least 100 miles. That means avoid revving the engine up to maximum power, don’t tilt too far leaning into a turn or blast into corners. 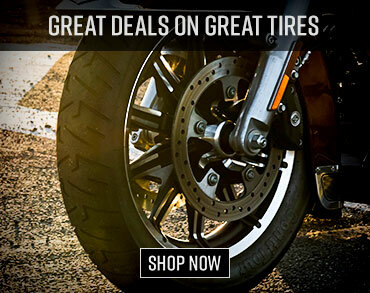 This gives riders time to get the feel of the new tires, to find the edge, and will give them ample opportunity to find the best road grip for a range of speeds, acceleration and handling use. After your first big ride, check and adjust the tire’s inflation to recommended levels after it has cooled for at least three hours. Off-Road – A new dirt tire can be toast in 100 miles. The break in period for off-road is as quick as your learning curve can handle. You still need to be careful at first and get used to some of the grip qualities and handling characteristics so that you don’t overestimate the available traction. Sunlight – Tires stored in direct sunlight for long periods of time will harden and age more quickly than those kept in a dark or dimly lit area. Washing your bike’s tires can be both good and bad. Make sure to scrub off any harsh chemicals like oil or gasoline, but stay away from Armor All. Soap and water will be fine. Oil and Gasoline – Prolonged contact with oil or gasoline causes contamination of the rubber compound. Wipe off any oil or gasoline immediately with a clean rag. This warning applies to corrosives or non-rubber compatible liquids as well. Avoid cleaners or dressings like Armor All. These may degrade the rubber and remove ozone cracking and weather-checking resistance. If you’ve got raised tires with sidewalls, white stripes or raised white lettering, which are common on cruiser motorcycle tires, use a mild soap solution to clean them up and then rinse with plain water. Always seek expert inspection of the tire after plunking a curb, pothole or whenever you run over something hard. If a bulge appears, or if tire pressure decreases, don’t ride on it. Take it in and have your local dealer check it out. With all the numbers and letters on the side of a tire, it’s easy to get confused, so here is the basic breakdown of what each one designates. There’s a ton of information on the sidewalls of your tires. Learning how to read the markings will make it easier to pick out the right tread for your machine. If you’re going to be stuffing the saddlebags for a long trip or plan on taking your honey on a nice road trip, the added weight is going to change the handling characteristics of your bike. Luckily, the good people at the International Standards Organization (ISO) have researched how much pressure needs to be in a tire when a bike is carrying extra weight and provides riders with the results of their findings in the form of the ISO Load/Speed Index. This code, when present, appears after the size marking. The code is made up of three characters– two numbers and a letter. So, if your tire is stamped like this – 130/90 – 16 67 H – then the Load/Speed Index is the 67 H. The two-digit number is a code for the maximum load carrying capacity of the tire. The letter is a maximum speed rating and lets you know the highest speed at which the tire may be used safely with a full load when the maximum listed tire inflation pressure is used. Sometimes tires won’t have the Load/Speed Index listed at the end. They sometimes use the letters below stamped in between the width and the wheel diameter. The following table lists the speed ratings for each category of tire. The speed rating means that when a tire is pumped up to the maximum inflation pressure when carrying a load, the tire will perform safely up to a designated speed. The amount of pressure that needs to be in the tire, the maximum load that specific tire can handle and the highest speed you can travel at safely on that tire is stamped on the sidewall for you. You just need to know how to understand the code. Click this link to see a list of speed ratings. Tires designed to exceed 149 mph have specific ratings. Check with your local dealer about availability and use of these specialty rubbers. A couple of quick notes… Certain “V” or “VR” rated tires may have a speed capacity greater then 149mph (240kph). Check with your local tire distributor for maximum speed information if your motorcycle exceeds this speed capability. Tires also come with a Z or ZR rating. These are high-performance tires built for speed. When they are pumped up to the max, the tire is will roll safely with the maximum marked sidewall load at sustained speeds in excess of 149mph and up to a speed determined by the tire manufacturer when installed on a specific motorcycle. Again, check with your local tire manufacturer to get these numbers. And don’t think that putting on a tire with a higher rating will upgrade your bike’s performance. When a motorcycle manufacturer decides on the tires for a particular model, they make sure that the speed rating of the tire meets the maximum speed capability of the motorcycle. If you fit higher speed-rated tires, there is a good chance that you will sacrifice some other performance aspect such as mileage. This being the case, it is usually best to stay with the speed rating of the original tires.